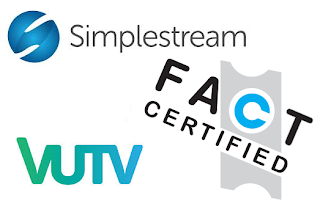 Simplestream has been certified by the UK's leading content protection organisation as meeting the criteria for the secure transmission of TV channels to subscribers. The company, together with S&T, is launching the new VuTV platform on Freeview channel 238 this autumn. FACT, the Federation Against Copyright Theft, is satisfied that the new internet delivered service to compatible Freeview HD receivers is suitably protected against attempts to infringe copyright, including piracy. Pay TV service VuTV, which will be available on recently built Freeview HD devices connected to broadband internet on channel 238 from this autumn will launch with channels including Viacom's MTV, Nickelodeon and Comedy Central, A+E Network's Bio and History channels and Turner's TCM and Cartoon Network. Subscription details are expected to be announced shortly. The channels are being downlinked from satellite, transcoded and streamed by Simplestream to authorised devices using a range of content-protection systems, including Adobe Access, Microsoft PlayReady and Strategy & Technology's Bastion. "It’s important we offer our clients the very best service in terms of securing their intellectual property," says Adam Smith, founder and CEO of the SimpleStream Group. "The certification by FACT shows our commitment and recognises our expertise in the complex area of secure content delivery." Eddy Leviten, FACT Director of Communications, added, "FACT Certification is the leading industry standard across the audio-visual creation, distribution and supply process. We are pleased to add Simplestream’s Media Hub and wish them continued success." Simplestream's Media Hub facility, based in North London, uses hardware supplied by Garland Partners, reseller of professional solutions for streaming video over IP networks. "We are pleased to have worked with Garland Partners on our new Media Hub facility" said Smith. "The SimpleStream Group already downlinks and streams over 80 UK channels. The new facility significantly expands our capacity and affirms our position as a leading vendor of live streaming solutions in the UK. "We have helped Simplestream create a workflow using a robust, high-density, future-proof and, most importantly, modular OTT delivery solution," says Lorna Garrett, Director of Garland Partners Ltd. "As the number of channels they downlink and stream continues to grow, we simply add more DVB blades and video transcoding modules to existing chassis. This solution helps Simplestream cut down on data-centre costs for rack space, whilst still affording their clients with the level of protection needed for the streaming of premium television content online."